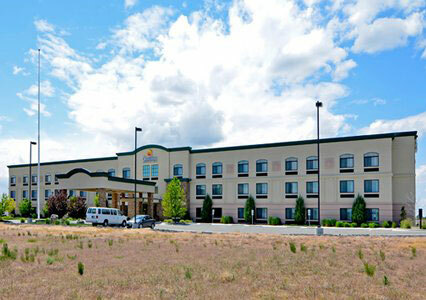 This Comfort Inn and Suites is not to be overlooked when searching for hotels in Jerome, Idaho. Arguably the best hotel in town, it offers attention to service, comfortable rooms, and plenty of great amenities. Better yet, the Comfort Inn and Suites in Jerome is situated just north of Interstate 84 and is convenient to many area attractions. These attractions include the Perrine Bridge, Shoshone Falls, and a variety of natural hot springs. With such amenities as free high-speed internet access, free weekday newspapers, and an indoor heated pool and hot tub, the Comfort Inn and Suites in Jerome, Idaho has little trouble satisfying its guests. The hotel only becomes more appealing when you also consider the free hot breakfasts, the convenient business center, and the quality of the guestrooms. Flat-screen TVs with cable figure among the standard amenities, as do fridges, microwaves, and desks. Some rooms feature additional perks, such as sofa sleepers, jetted bathtubs, and kitchen facilities. Guest laundry is available at the Jerome Comfort Inn and Suites, and for those who are traveling with their four-legged friends, pets are allowed. Extra spacious suites are available for those who wish to take advantage, and regardless of the room in question, the rates are more than reasonable. It's worth noting that the free breakfasts at the Jerome Comfort Inn and Suites are more than your average continental hotel breakfast. They come with the option to enjoy eggs, meat, yogurt, fresh fruit, cereal, hot waffles, and more.